Tribal Stencils cover an astonishing array of design possibilities, from the traditional tattoos of indigenous and aboriginal cultures, to the latest in graphic design for the body. 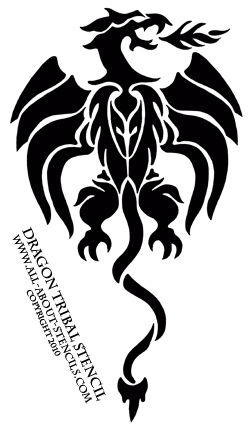 The dragon is a classic tattoo stencil design that shows the influence of Japanese and Chinese culture in western tattooing. It is a culturally far-reaching symbol whose apparent bad temper should be interpreted as simply amoral, neither good nor evil. This design is popular with both men and women. Tribal tattoos are the most popular tattoo designs around today. They mean different things to different people but their appeal cuts across all boundaries and have been around for centuries. It’s reported that tribal tattoos of mythical creatures were found on the mummified remains of a Bronze Age man who died over 5,000 years ago. Cultures from every corner of the globe have practiced the art of tattooing, including the North American Indians, Maori, Polynesians, Samoans, Africans, Egyptians, Hawaiians and the Tahitians to name a few. The general practice of getting a tattoo is popular these days, as it allows people to express a personal freedom and also a uniqueness, that defines them as an individual. The tribal stencils tattoo in particular is popular because of the mystery behind this form of tattoo and because the tattoo links you with other wearers, giving you a sense of belonging and connection with others. 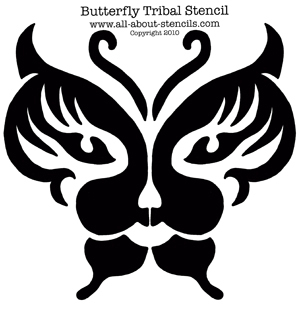 Butterfly tribal stencils are generally feminine tattoo design choices. It's popularity shows the growing influence that women have in contemporary tattoo culture. Even so, the Butterfly is not entirely the exclusive domain of women. The Roman Emperor, Augustus, took it as his personal symbol, and the warrior priests of the Mexican Popolucas peoples sported the Butterfly as a motif on their breastplates. Their Butterfly was also the symbol of fire. Delightful, magical and transformational, the Butterfly reminds its admirers of the mystery of nature and the richness of human imagination. In ancient times, the tribal tattoo was used to mark the person being tattooed as a member of a tribe, and in some cases the position of that person in the tribe. In some cultures, the actual process of getting a tattoo was performed at a ritual, for example when the person was coming of age. Other cultures in Europe would get a tattoo of their family crest, to identify their origins. In some cultures, the location of the tattoo on the body is as important as the tattoo itself, as different locations had different meanings. These days, the location of the tattoo comes down to self expression more than anything else. The designs were, and are still, commonly linear geometric motifs. The tribal tattoo is traditionally black in color, although this has changed in modern times. The pure black tattoos give a more striking appearance, due to the sharp lines and edging. When color is added the edges become less defined in appearance. By the way, this is part of our Free Stencils Collection. We have so many to offer that they are scattered throughout this web site so keep browsing the pages and come back here for all your Stenciling Ideas. Hey! Don’t forget that I (and everyone else) want to see what you have done with your tribal stencils. Just click on Stenciling Projects to get your masterpiece showcased here on this web site. Won’t that be exciting! Or if you have any questions or want to share information join in on the Stencil Blog. Well, I hope to hear from you soon. Return to Home Page from Tribal Stencils. Return to Free Stencils from Tribal Stencils.